One of the crops that continues to do well for us this season is beets. And while we’ve had our asses kicked in the brassica department I’m trying to focus on things that are doing well instead of dwelling on our failures. I love beets and I’m really happy that our CSA members and farmers market customers have gotten an abundance of them this season. 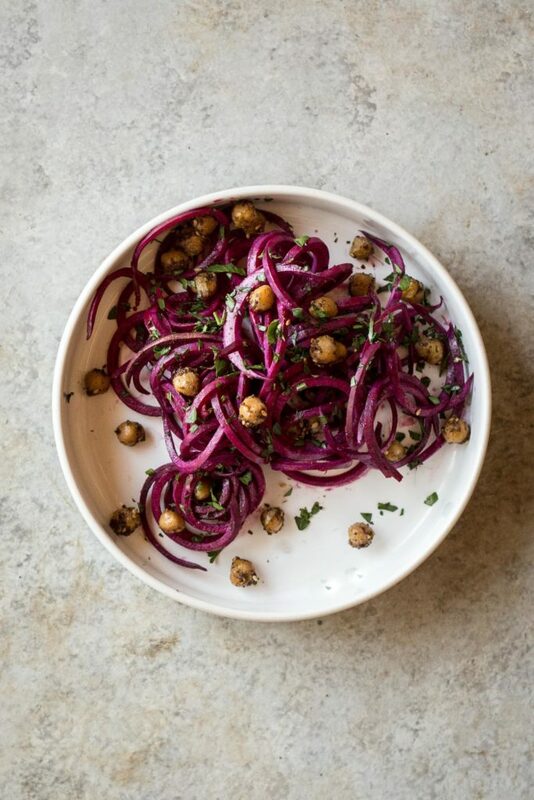 This recipe for beet noodles is killer! I’ve encouraged our CSA members to purchase a spiralizer because they are a great tool to turn to when you’re swimming in veggies and aren’t quite sure what to do with them all. You can make noodles out of anything and beet noodles are a new favorite around here! We lightly cooked our noodles in a bit of olive oil and then tossed them in a delicious sumac tahini sauce. The addition of za’atar spiced chickpeas turned this simple dish into something worth sharing with everyone! I’ve been frequenting the local spice shop here to get my hands on good quality fresh spices but if you don’t live near a good source I’d recommend purchasing your spices from Savory Spice Shop. They’ve never let me down and their products are fresh and top notch! I hope you all love this simple dish as much as we do. Feel free to bulk this up with some shredded chicken or avocado to make it a complete meal. Preheat the oven to 350F. Pat the chickpeas completely dry with kitchen towels (the drier they are the crispier they'll get). In a large bowl toss the chickpeas with the oil, za'atar and a few pinches of salt and pepper. Place the chickpeas in a single layer on a baking sheet and roast in the oven until golden brown and crisp. About 1 hour. Toss the chickpeas every 15 minutes or so. While the chickpeas roast prepare your sauce. Whisk all the ingredients together with an immersion blender or small food processor. Taste for seasonings and adjust as needed. Heat the oil in a large skillet over medium heat. Add the beet noodles and cook, tossing often until al dente. About 8 minutes. Remove from the heat and drizzle the beet noodles with half of the sauce. Toss well to coat. Divide the noodles between bowls and drizzle with additional sauce, the chickpeas, and minced parsley. Season to taste with salt and pepper. I’m really liking the vegetarian recipes! Love the colours of the beet noodles! Farmers are the real life heroes in this world. You have to be so resilient, energetic, positive and hard working in the face of uncertain and changing weather. I salute you! Not to mention being amazed that you manage to run a top notch blog with awesome recipes and photography at the same time!! Whew!